There was not only snow in Paris this winter but also much rain. 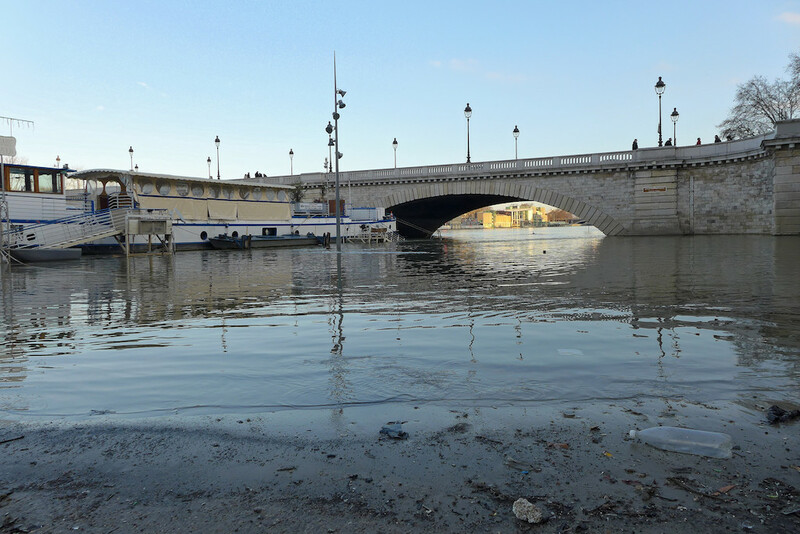 So much rain that it had produced a significant rise in the river Seine level: the banks had been flooded and closed. 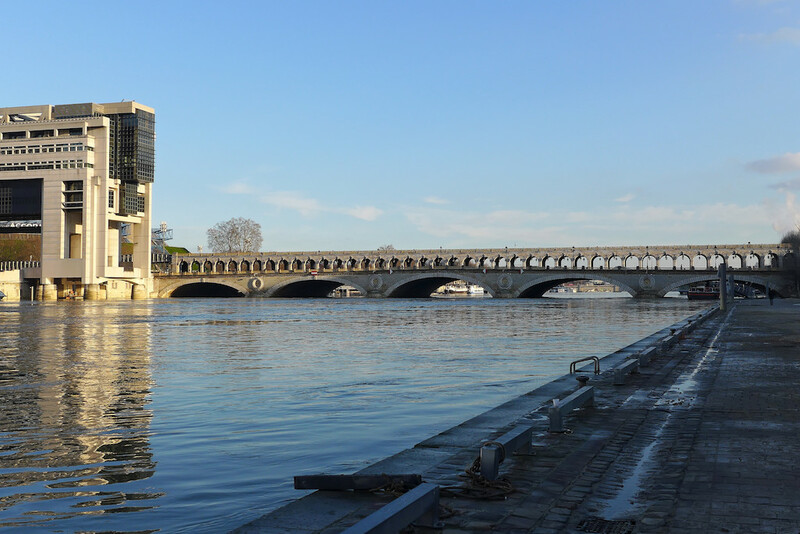 When they reopened three weeks ago I had a walk along the Seine towards east, from the Ile Saint Louis to the Bibliothèque François Mitterrand. It was on a sunny Sunday afternoon, the light was superb, the views on the Paris bridges amazing and the signs of the drop in the water level could be seen here and there. Our walk starts at the Institut du Monde Arabe. 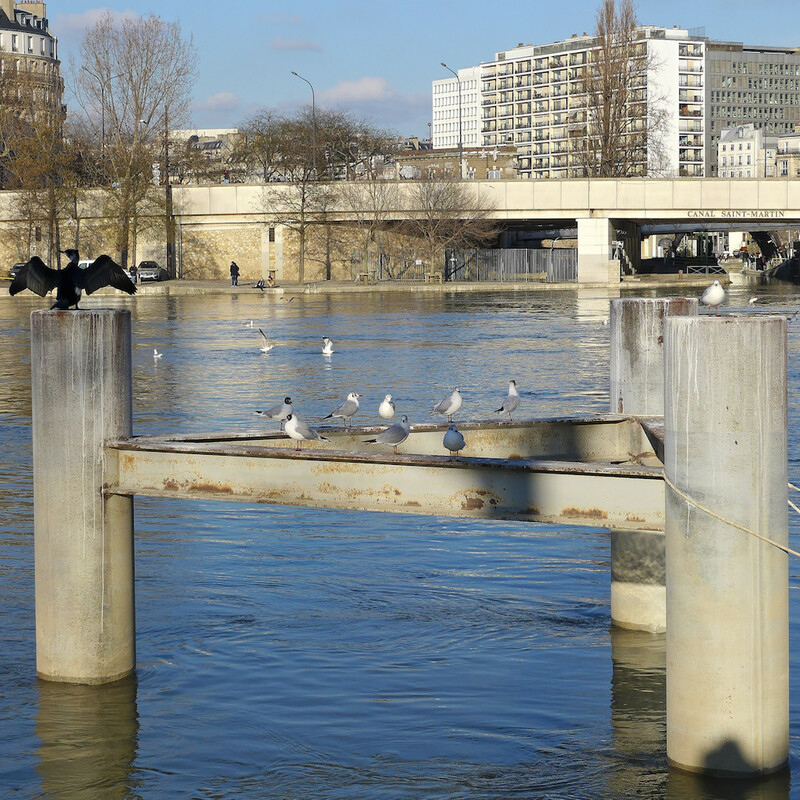 There the Seine divides into two branches round the Ile Saint Louis -and further west the Ile de la Cité. Along the river a pleasant garden has been laid out: the Jardin Tino Rossi. 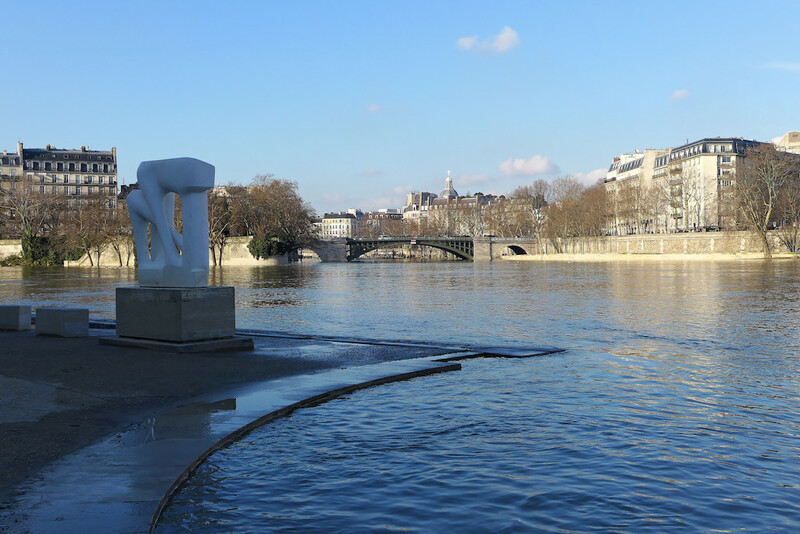 There one strolls very close to the water in the middle of beautiful trees: pines, magnolias, Japanese cherry trees, weeping willows,… and discovers here and there the sculptures made by famous contemporary artists such as César, Brancusi or Zadkine. And on the esplanade one can see regularly groups of musicians or dancers. A little further one walks along the Péniche du Cœur, which belongs to the famous non profit organization created by Coluche in 1985, Les Restos du Cœur. 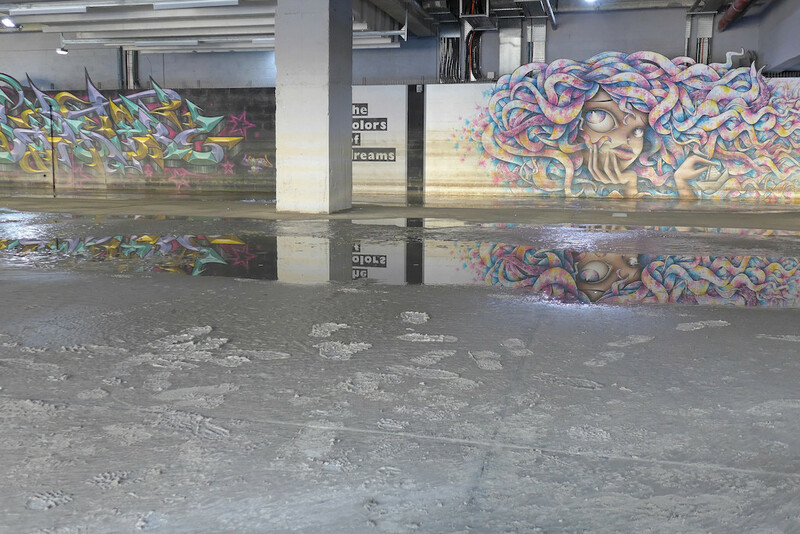 It provides accommodation and food to homeless people and has just reopened after the Seine floods. 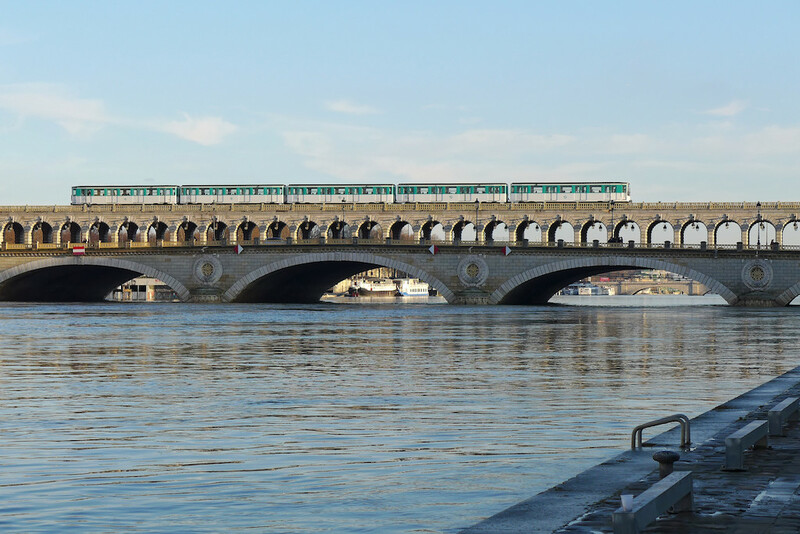 The first bridge to span the Seine east of the Ile Saint Louis is the Pont d’Austerlitz. 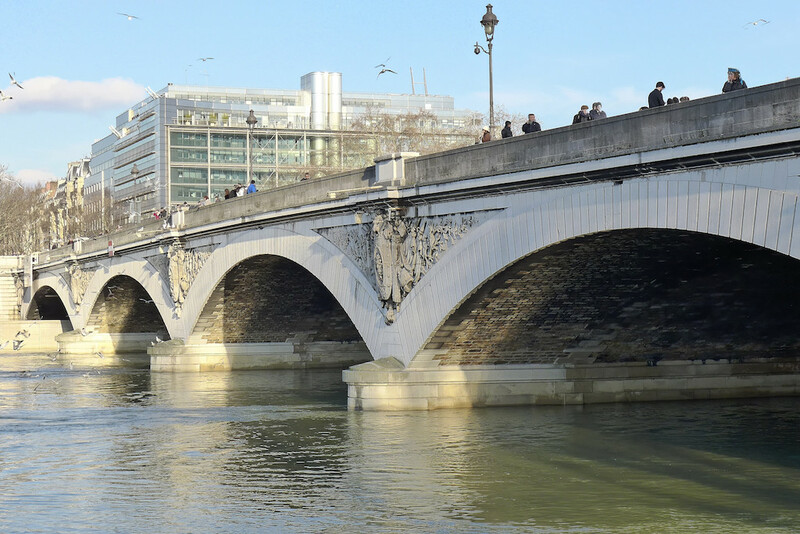 It gets its name from the victory won by Napoléon: the first bridge built at that location had been inaugurated in 1807, two years after the battle. It was renovated fifty years later and the present stone bridge dates from 1855. It is decorated with the names of the main officers killed during the battle. A bit further one is surprised by a cable winch diving into the water. 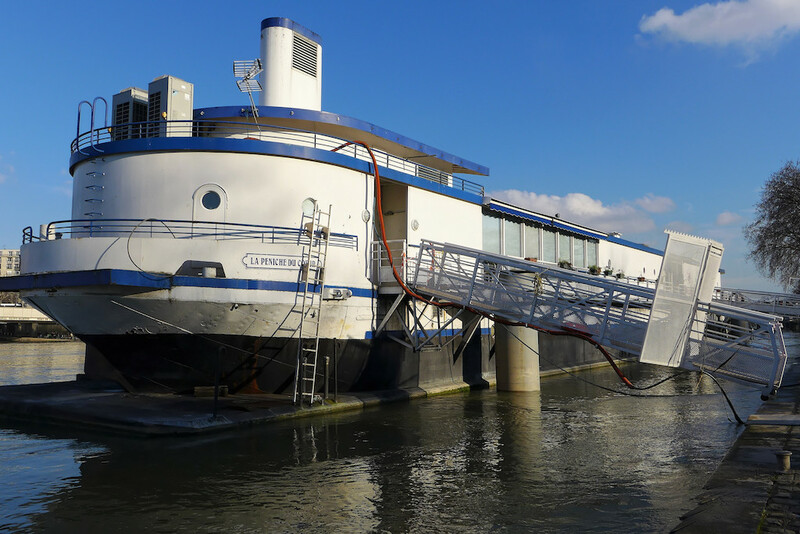 Here is liying at the bottom of the river La Louise-Catherine, a barge which used to be renovated by Le Corbusier in the early 20th century and turned into a refuge for homeless. For a couple of years the barge has been under repair so as to be converted into a cultural site. But last month the Louise-Catherine sunk when the Seine level has dropped. 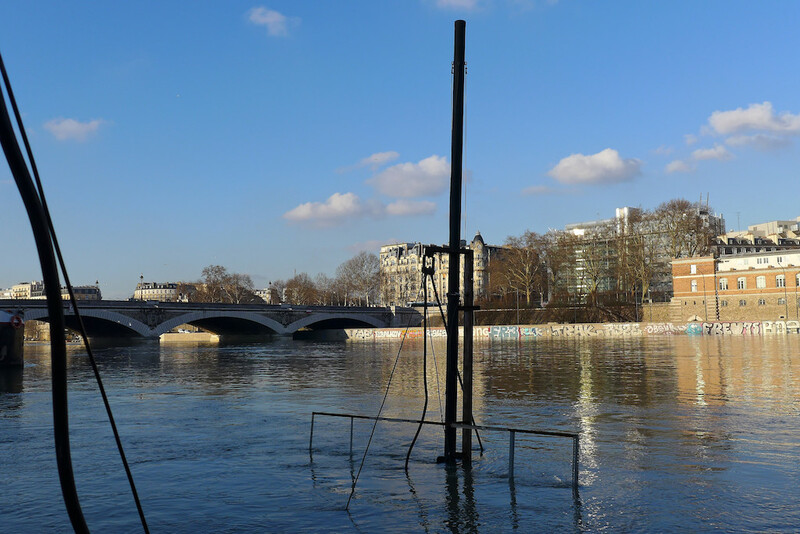 It should be afloat again when the Seine returns to its usual level. One reaches then the Viaduc d’Austerlitz. 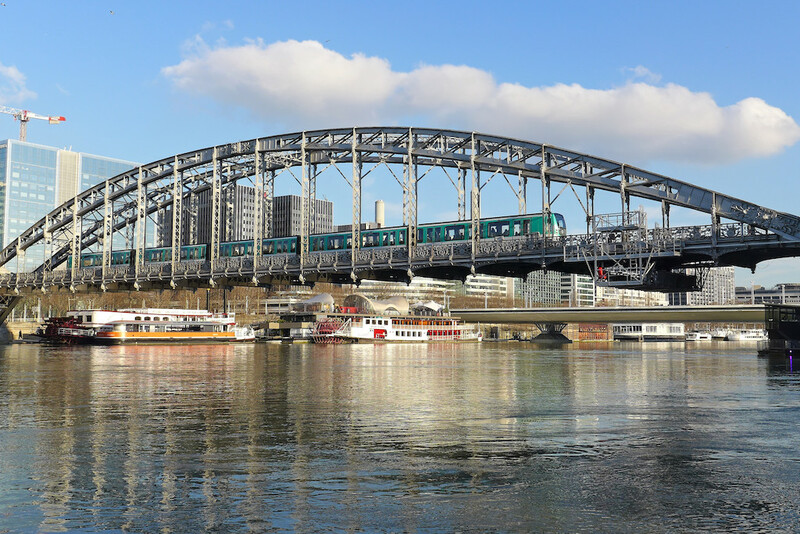 This bridge was built by Eiffel and is used by the metro line 5 to cross the Seine between the stations Quai de la Rapée on the right bank and Gare d’Austerlitz on the left. I love its elegant silhouette! Shortly after the Viaduc d’Austerlitz one notices a wooden construction on the water. 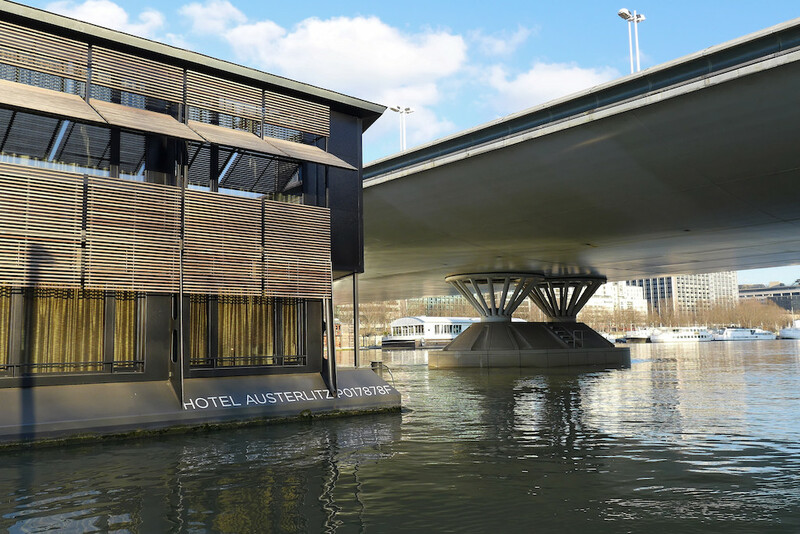 This is the first and unique hotel on the Seine in Paris: The Hotel Off Paris Seine. It offers 54 rooms and 4 suites for a unique experience. One can also enjoy the bar either for an evening drink or a brunch on Sundays. Then one walks under the Pont Charles de Gaulle which looks like a white airplane wing. 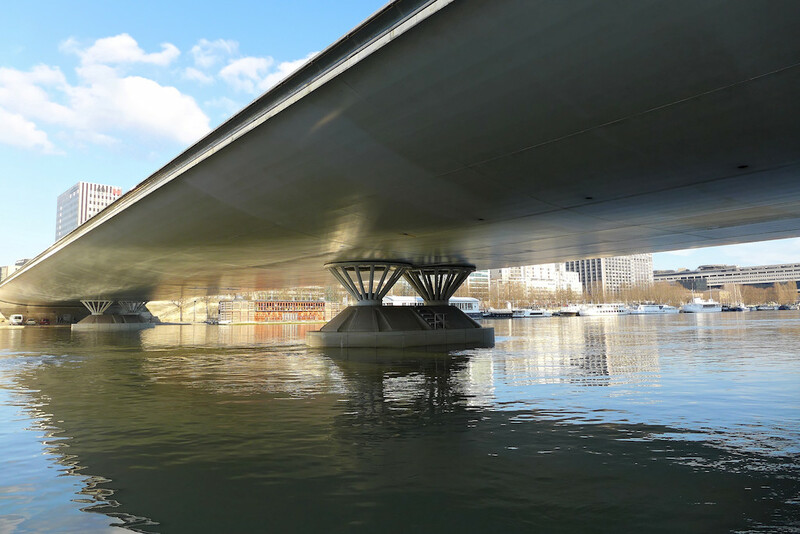 This bridge was built in 1996 so as to face the development of the new areas of Bercy in 12th arrondissement and Bibliothèque in 13th arrondissement. It offers an additional road to reach the Gare de Lyon from the left bank. As one walks towards east the banks become less busy and more deserted. 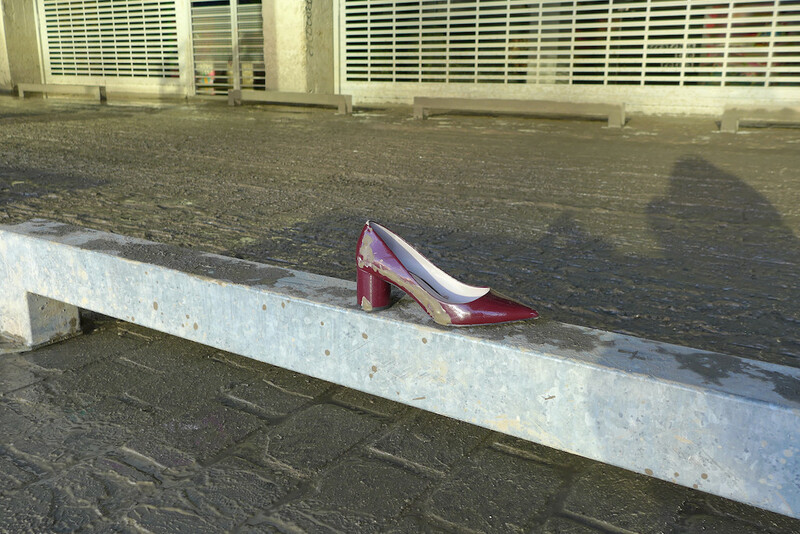 One is far from the bubbling city and the walk under the Cité de la Mode et du Design could even be a bit disturbing when there are no other walkers. 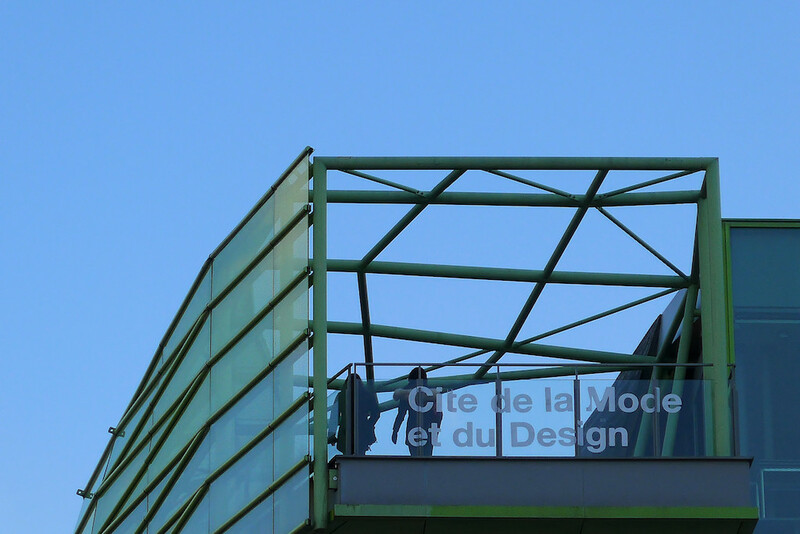 The Cité de la Mode et du Design was built in 2009 on the premises of former warehouses. The structure of reinforced concrete was preserved and a “plug over” made of glass and metal painted in bright green was added. The undulating shape of this plug over makes one think of a wave or a snake. I am not really fond of its design at daylight; I prefer the building at night when it is lit up and reflected in the river. The Cité de la Mode et du Design shelters exhibitions and performances, a renowned School -the Institut Français de la Mode-, and several clubs, cafés and restaurants. My favourite is the Rooftop, so pleasant at night in summer! One feels relieved when one leaves the basement of the Cité de la Mode and can see the sky again. The view on the Pont de Bercy is just amazing. I like this bridge with its two levels : one for the cars; and above it a viaduc for the trains of metro line 6. 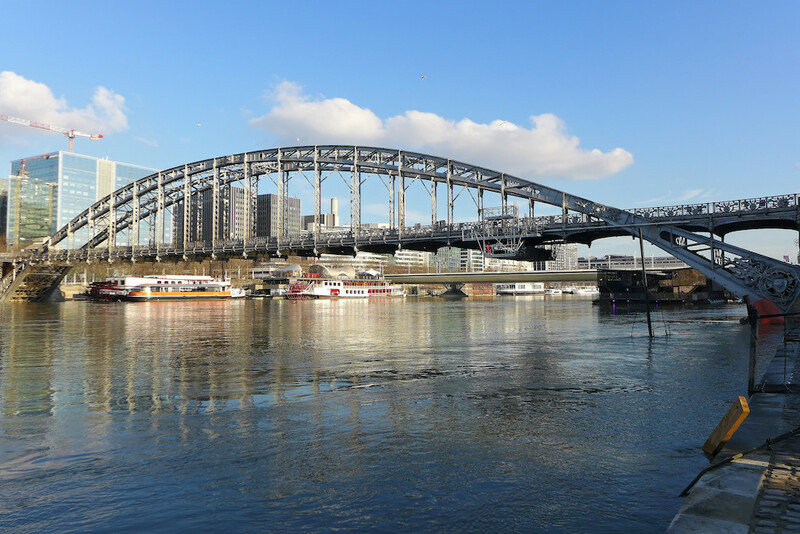 At the end of the bridge, on the right bank, one can see the Ministry of Economy and Finance and the Accor Hotel Arena, where concerts and sports events take place. The banks now cross the new living areas of Eastern Paris: Bercy on the right bank and Bibliothèque on the left bank. 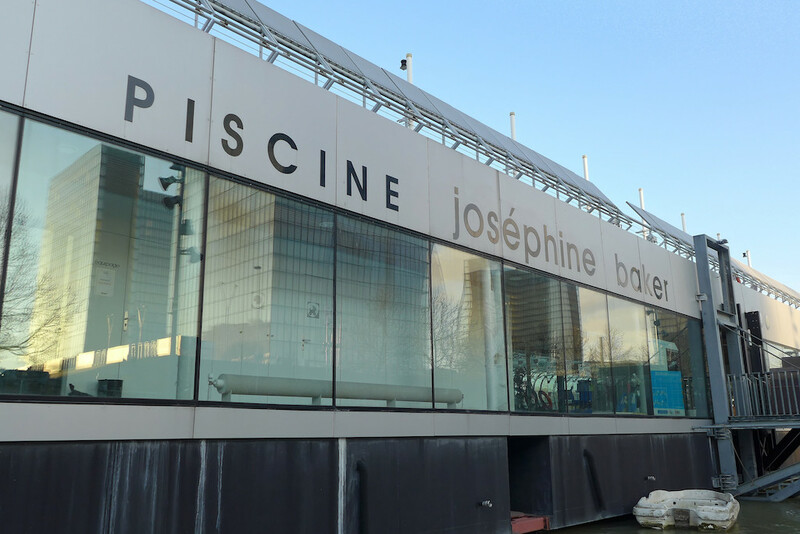 Just before reaching the huge site of the Bibliothèque François Mitterand one can see the Piscine Joséphine Baker which is a public swimming pool where one can swim at the Seine level and with a view onto the river. Very pleasant indeed… but also quite crowded in summer. 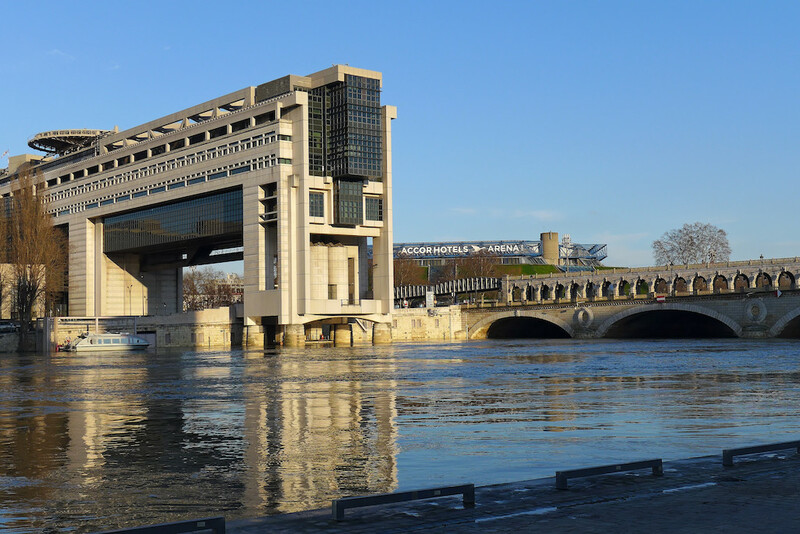 Around the Bibliothèque François Mitterrand the banks are really pleasant and lively by fine weather, especially in summer, as there are several trendy cafés where to enjoy a drink with a view on the elegant Passerelle Simone de Beauvoir. The atmosphere reminds the one of the Thames banks at Southwark in London: the river is wide, the surrounding buildings are modern, the clientele of the cafés are mainly local people. 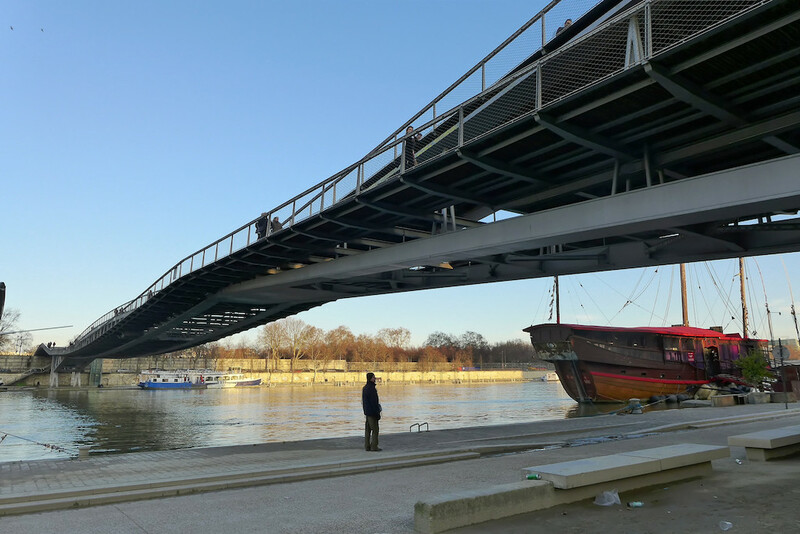 The Passerelle Simone de Beauvoir is one of the four pedestrian bridges crossing the Seine in Paris. 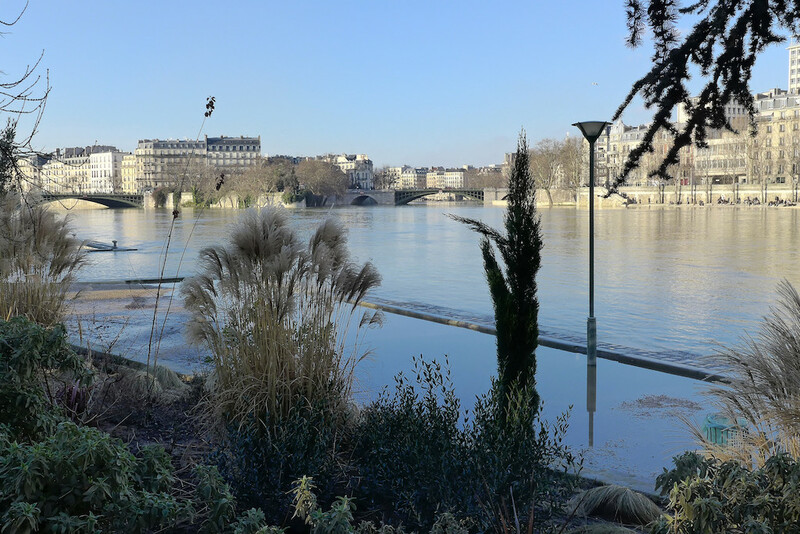 It was inaugurated in 2006 and makes the link between the esplanade of the Bibliothèque François Mitterrand and the Parc de Bercy; and next to it the pedestrian area of Cour Saint Emilion. 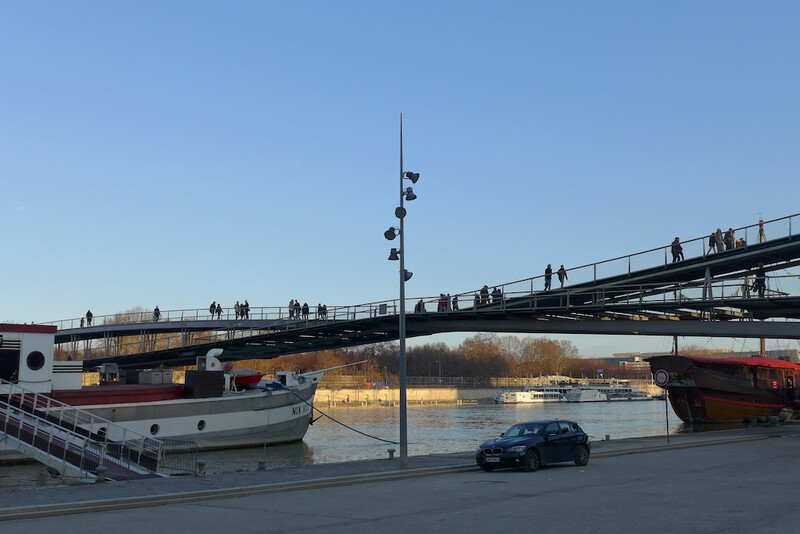 The two levels of the Passerelle are reserved to Pedestrians and cyclists. One does not use it only to cross the river but also just to enjoy walking on it, feeling its undulation and admiring the views from it: a true delight! Beyond the Passerelle Simone de Beauvoir the landscapes are even wilder and less urban. 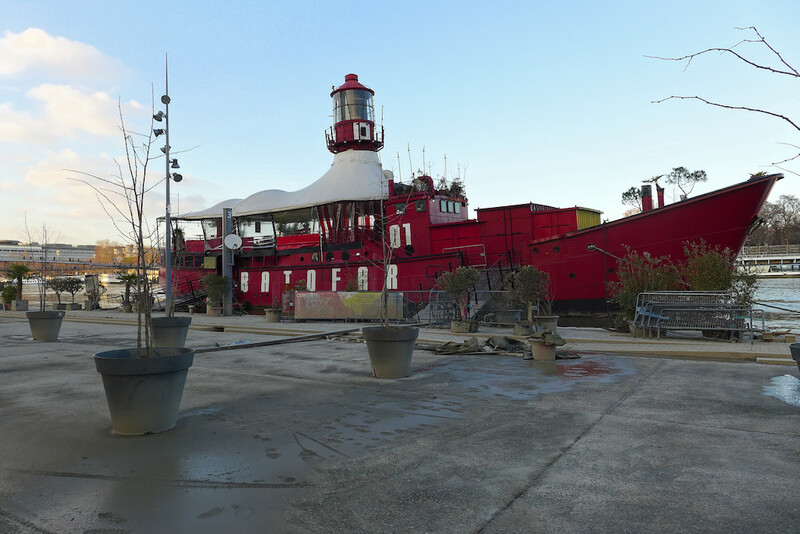 One walks past the Batofar, an emblematic site for concerts and cultural events since 1999. Every Parisian knows the silhouette of this small red boat with its huge light: one cannot miss it! Our walk ends at the Pont de Tolbiac, which is the last bridge but one spanning the Seine in Eastern Paris. Thanks to the rise in the river level the stairs leading to the upper banks are diving into the water and one has to walk back! At the foot of the bridge it looks like the seaside at ebb tide. The whole walk takes about one hour and a half -one way. The landscapes are as beautiful as unusual for Paris and I like it because it really takes you to another world. One piece of advice: choose a sunny day with a beautiful light! 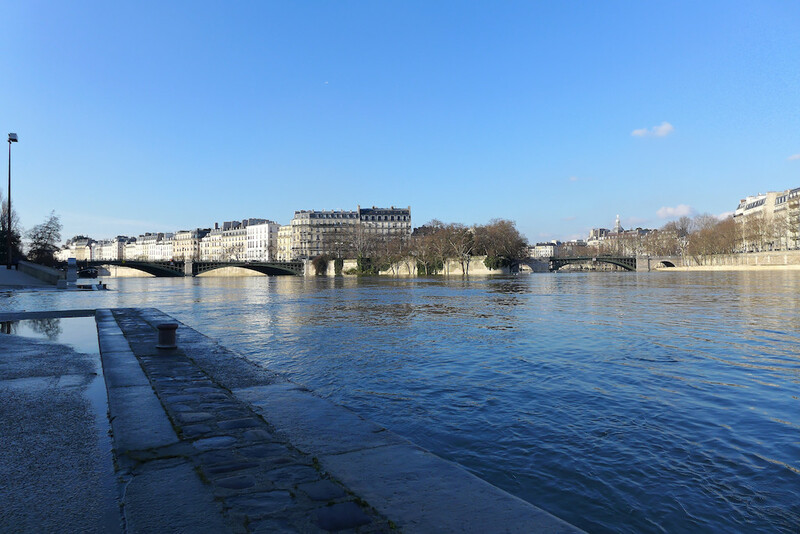 Next time I will walk toward west, where the bridges are also superb and the views on the Parisian monuments amazing… although more traditional and familiar. See you soon!